Stock Transaction Tax - What Does It Mean? What is the "stock transaction tax"? How much would the tax be? How might trading be impacted by a "stock transaction tax"? 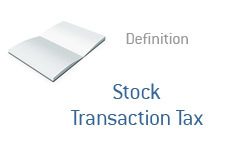 The "stock transaction tax" was first proposed in the United States in February of 2009. HR 1068, aka "Let Wall Street Pay for Wall Street's Bailout Act of 2009", was originally introduced to the House of Representatives on February 13th, 2009, by Oregon Representative Peter DeFazio. The idea of a stock transaction tax has been revived in the past number of weeks, mainly due to the bonuses being dished out on Wall Street and the sky-high budget deficits in the United States. This bill would call for a tax of 0.25% on stock transactions, as well as a 0.02% tax on derivatives. The intended purpose of the tax? "..to recoup the net cost of the Troubled Asset Relief Program". According to the bill, the 0.25% tax alone "could" raise $150 billion dollars per year. Further, the tax would "phase out" when "the cost of the bailouts are repaid". Opponents of the tax point to countries such as Sweden who have unsuccessfully implemented such a tax, as well as pointing out that a stock transaction tax would decimate trading volume levels in the United States. Proponents of the tax believe that Wall Street should contribute to the cost of the bailout, and that this is the most "painless" way to do so.